What if your golfing holiday in Marbella took in some of the best views on the Costa del Sol? And what if those vistas accompanied you from dawn to dusk? With its privileged position, Rio Real Golf & Hotel offers panoramic vistas wherever you turn, but we’ve selected six of the best. Rio Real Golf & Hotel is one of the very few beach-front golf courses on the Costa del Sol. And while you can see the sea from plenty of vantage points on the course, we think the best views of the Med come at the 4th. This hole gradually makes its way south towards the sea. Look for the Mediterranean on the horizon as you strike the ball and for the sand as you approach the hole. This is one of the best beaches in Marbella so take your time as you contemplate the views – and make a note to pop down later for a stroll on the sands. The Sierra Blanca range lies on Marbella’s doorstep and its striking profile offers a stunning backdrop to all postcards of the resort. You can spot the mountains from just everywhere on the Rio Real course, but nowhere better than at the 8th. The 8th takes you up high to commanding vistas of the mountains. Take in the entire skyline as you pause to strike. And don’t forget to look behind you – this hole also has great views of the sea. Along its over 6km of course Rio Real Golf includes some of the most stunning golf scenery on the Costa del Sol. As one of the oldest courses, the landscape has had years to mature. The result? 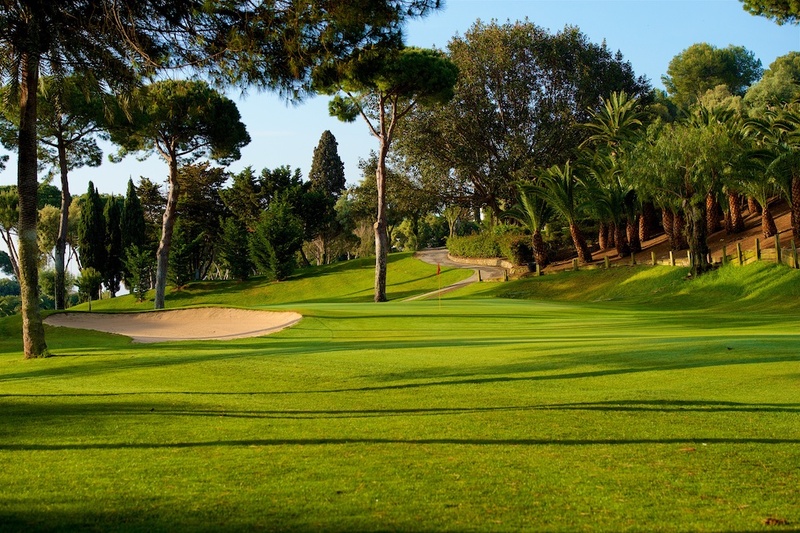 Long, majestic avenues of trees – olives, palms, pines… line the holes the length and breadth of the course. Probably the best place to admire the trees in their full glory is the 13th. This hole ranks as the longest and most spectacular of all 18 at Rio Real and you certainly see the trees at their best along the 5,511 metres. You don’t have to play golf to take the jaw-dropping views at Rio Real Golf & Hotel: they’re everywhere. Take the restaurant, for example. The entire area including a spacious terrace takes in several holes on the golf course plus the mountain backdrop behind. And you can even glimpse the sea beyond the trees to the south. All you have to do is pick your table and then settle down for some seriously stunning views. Enjoy them as you lunch, dine or just a pre or post-game drink. The restaurant terrace faces west so this is a great spot to catch the sunset too. Away from the golf course on the top floor of the hotel is one of Rio Real Golf & Hotel’s hidden secrets. And yes, it also boasts views to die for. Make your way up to the pool area, choose your sun lounger and take in the mountain views all around you. The hidden retreat comes into its own at night when it’s just you, the stars and the view. But perhaps the best way to enjoy the views at Rio Real Golf & Hotel is to book a stay in the boutique hotel. All the spacious rooms have magnificent views of the golf course – imagine waking up to your very own frontline golf vistas. And if you’re looking to make those views even more stunning, make yours the Albatross Suite. Take our word for it – views really don’t come better than this.